Pilates is an exercise method usually using your own body weight to train the body. It is excellent for reducing aches, stiffness, tension and tiredness, and increases flexibility, strength, balance and general fitness. This Pilates class also includes a Hiit (High Intensity Interval Training) challenge to improve cardio fitness – resulting in a healthy heart! The class has levels to all the exercises so that you can work at your own pace and improve in your own time. 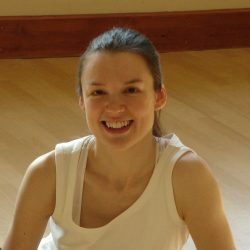 Tutor Bio Miranda has over fifteen years experience teaching fitness and dance classes. Trained in Dance and Theatre and further qualifying with a teaching certificate she taught dance in community projects, colleges and for Universities. Miranda's number one passion is for optimum health and wellbeing of the body and mind, which is why Miranda went on to train as a Pilates teacher and Personal trainer. She is active in keeping up to date with the latest research and developments in fitness, nutrition and health. And, as she still enjoys the wonders of dance, Miranda teaches Ballroom and Latin dance and technical classes combining dance technique and Pilates. In her free time Miranda enjoys running, reading, dancing, coffee with friends and going to the beach! Please contact the tutor on 07738 353665 to discuss your requirements.